Aarsun Woods brings to you this Handcrafted Wooden Temple Mandir made from premium quality Teak Wood (Sagwan / Sevan) and Teak Ply. 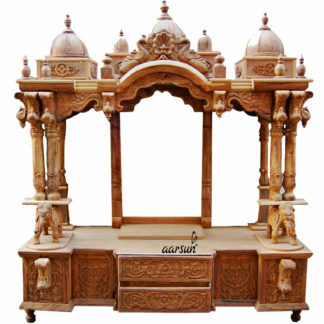 Wooden Temple plays a significant role in instilling positivity to our home and the place kept. Please note that the back, the base where idols are to be placed and in the inner porttions of the temple is made from teak plywood.